LEON calls itself the pioneer in “naturally fast food,” and its Mediterranean-leaning menu includes falafel wraps, chicken, basil and pine nut salads, vegan burgers, crushed pea salad and yogurt sundaes. 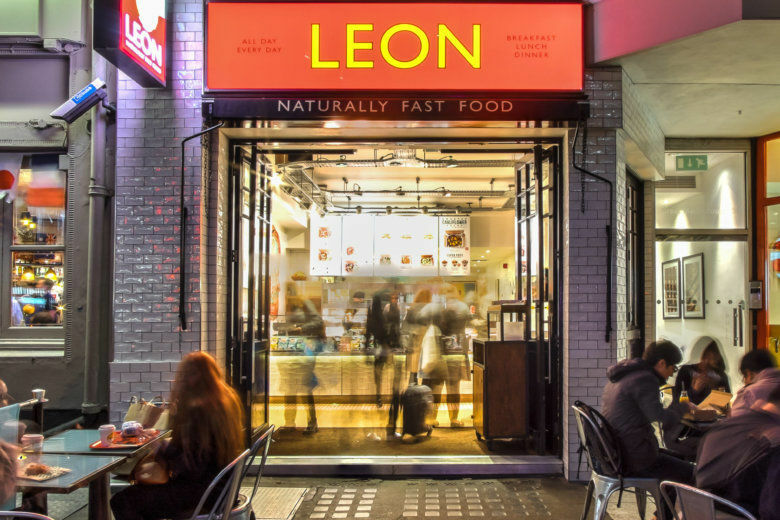 WASHINGTON — London-based LEON, a fast food chain founded in 2004 with a goal of making fast food healthy and natural, will open its first U.S. location in downtown D.C. this month. The LEON restaurant will occupy space at 1724 L Street, NW, in the Washington Square building. The breakfast menu also includes smashed avocado and halloumi muffins, as well as honey and toasted seed oatmeal porridge. LEON was co-founded by former Proctor & Gamble executive John Vincent and is named after his father. It has 60 locations in the U.K., Norway and The Netherlands. Why did he pick D.C. for the first U.S. location? Like its London restaurants, the D.C. location will be powered by sustainable energy. The chain has also removed all plastic straws and cutlery, and packaging is compostable.